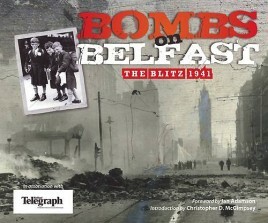 An event in the history of Belfast which had a profound effect was the blitzing of the city in the Spring of 1941. What seems inevitable now, that the Luftwaffe would target such an important manufacturing city, when at the time Belfast was thought to be out of range for the German planes. This left Belfast as one commentator put it ' the most unprotected major city in the UK". A heavy toll was paid in both human life and material damage, during the 4 raids almost 1000 people perished, 2500 were injured and most of North and East Belfast as well as the City Center reduced to rubble.